Hi all, I see from my twitter feed that this nova was discovered on June 23rd last, now being reported as magnitude 8.8 unfiltered. it seems to be slowly rising in brightness, my apologies if this had been covered already. Is there a VSP chart available yet to make observations of this nova? I visually estimated this star since end June, that was not easy because of the rich field in this Milky Way area but now the magnitude helps. I find the lightcurve of Nv Sct '17 so far to be most interesting. Unquestionably, it belongs to the class of slow novae, by far the most unpredictable in behavior, subject to erratic variability and for visual observers the most "entertaining" of all the nova types in my book. While probably still a bit early to conjecture Nv Sct '17 future, I might speculate that so far its lightcurve is suggestive of a class J nova (per Sterope, Schaefer & Hendren). Rather similar early behavior was displayed by V723 Cas and HR Del in the past. If indeed similar, the star might remain reasonably near maximum brightness, while perhaps subject to striking fluctuations, all the way until it nears solar conjunction...or possibly even longer! I'm rather surprised to find no one has mentioned this nova's dramatic re-brightening which has taken place over the past 50 or 60 hours. Although having faded from its 8.5 brilliance at maximum in the very last days of July to a magnitude of 11.0 to 11.2 by August 25th and oddly plateauing there until three nights ago, the nova is now experiencing a major re-brightening! Last evening before moonrise (Sept 10.0535UT) I recorded it as 9.5 magnitude and judging from the LCG's plot it would appear to still be on the rising leg of the re-brightening. Certainly a peculiar animal this one! It is brighter than 9.0 now.Worth to be followed with new enthousiasm! It is the first observation after 6 days of clouds and rain here in Rome: a great difference immediately noticed. Indeed I also saw it much brighter the past nights. Data are private for the moment. The lack of posts here commenting on this highly active nova's behavior continues to surprise me, as currently I regard it as probably the most interesting object in the sky, given how it is performing. Last evening I noted the definite beginning stages of yet another rebrightening of the nova...its second following the nova's primary peak back in the final days of July. 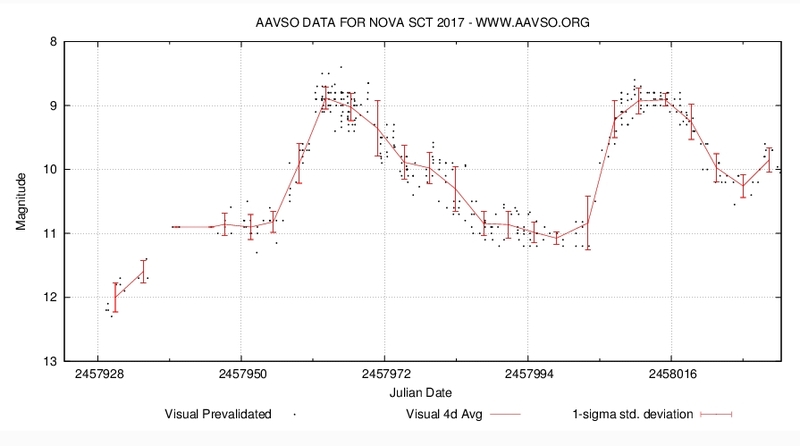 I note the distinct similarity of Nova Sct rather uncommon lightcurve to that exhibited by the recent naked eye nova visible in Sgr just two years ago. That one, V5667 Sgr, also displayed multiple dramatic rebrightenings, ultimately followed by a 6 magnitude "dust dip". Now if Nova Sct follows the same pattern, then we might anticipate a couple more rebrightenings to around magnitude 9.0 as it descends into the western sky. Then, as Sct approaches the evening twilight, or just as it enters it, we might witness a dust dip in its lightcurve, too. I agree that it is very interesting. 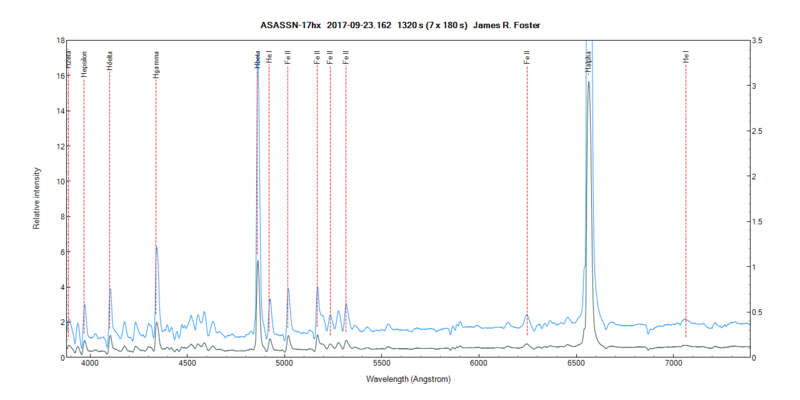 There is plenty of interest in the spectroscopy community with large numbers of impressive spectra being produced. I think it needs continuing intensive monitoring. My only other comment is that there seems to be a large scatter in the CCD measurements. I'm not sure why as there is a good selection of comp stars availble. Hi Terry Thank you for the specto link, for me (as visual observer) the issue with this large collection is the lack of summary or associated scientific info,... yet. For the second point, as already mensionned by John, you'r completely right. I send a message to this CCD observer which report those long vertical green ladders and some far out of the curve CCD observations but I don't got any answer. I did also push on the button "report discrepancy" of the new enhanced LCG but saw no action... Anyway the very last observations of this observer looks better. To avoid this large scatter, I only request the pure visual estimations while asking the curve. look at the attached file. But doing this I take off also the good V CCD observations. The transition phase (if/when it occurs) is always the most interesting stage of a Nova light curve for observers. Like John, I'm a bit surprised that people have been a bit quiet about it's activity of late! Thank you Paul much appreciated ! The last ATEL is almost a month old! It showed a classic Fe-II nova-like spectrum, but the lightcurve is so odd, the double maximum. GK Per-like oscillations?? I would note that Nova Sct '17 has begun its third re-brightening in the course of the past 50 or so days. The light curve of the nova resembles very few other previous novae whose light curves I've found in the literature, especially considering the amplitude of its re-brightenings particularly the first one. Unfortunately for me, the nova will pass behind some local obstructions in less than another month, preventing my following this very interesting object further. I'm particularly interested to see if this nova exhibits a "dust dip" prior to fading into the evening twilight. Yes it is! I just estimated it visually at 9.7, so this rebrightening now, is significantly larger than the one 3 weeks ago. Exact, I just estimated this exotic nova yesterday Oct 21.76, magn: 9.75, pefrectly in line with your observation. Following its recent third re-brightening which peaked near 9.0 on the 24th or 25th of October, the nova has exhibited a steady decrease in brightness which as of this morning (November 12th) has brought it down to magnitude 11.5 the faintest point it's been at in several months. Showing no sign of hesitation in this decline so far, I wonder if this may be the beginning of a "dust dip" which I've mentioned several times previously in this thread? The next week, or two, of the nova's brightness behavior could prove very interesting. When I look at the light curve I keep thinking of this star as the Roller Coaster nova. You are quite correct, Mike. No sooner had I posted the other day that it seemed as if the nova was finally going to decline into a "dust dip" its brightness turned around and began to rise toward yet another re-brightening peak!. As of this morning, reports indicated it had attained magbitude 10.0 and was still rising. Anyway, it's beyond any further observation for me now, having descended below my treeline in the southwest until next season.